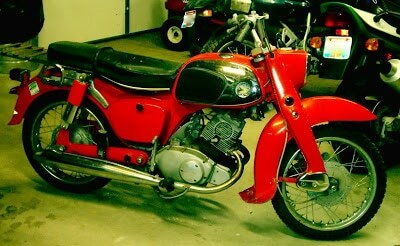 Today I’m talking about a different type of vintage item, my husband’s vintage 1966 CA95 (150 cc) Honda Benly. He purchased the bike as a project bike and after much work it was restored to running condition. He races this type of bike in vintage rallies so performance was more important than appearance (basically he is not interested in making the paint and chrome all pretty and pristine because it will just get dinged up). The bike could originally be bought for $460.00 according to this ad from the October 1960 issue of Cycle magazine which my husband purchased on ebay. 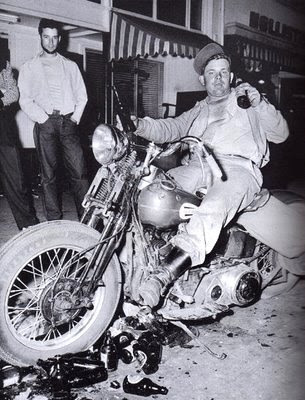 In the 1950’s the majority of Americans thought that only hoodlums rode motorcycles. This guy may have had one too many beers. 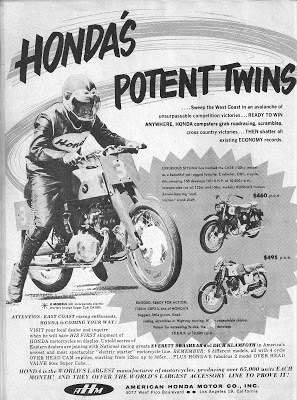 In 1962 Honda set out to change the American public’s perception of motorcyclists. They mounted a brilliant campaign to show normal everyday people riding motorcycles so they could create a whole new market for their product. They showed housewives, parents and children and other respectable members of society happily riding along. Their tag line was “You meet the nicest people on a Honda”. See, even Santa rides a Honda! This is a smaller bike, so I could probably actually ride this one if I ever learned how to shift. There’s something about the feet being involved that I can’t get. And then the clutch is on the handlebar????? Forget it, I’ll just drive my minivan. 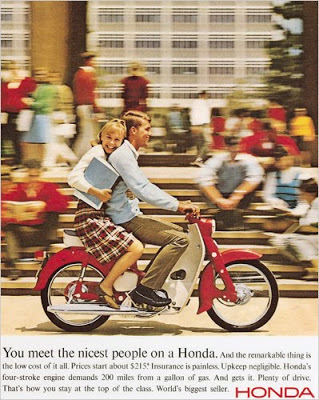 Pam, I love that vintage 1966 Honda Benly, it is just awesome! How much fun to go to a vintage rally! 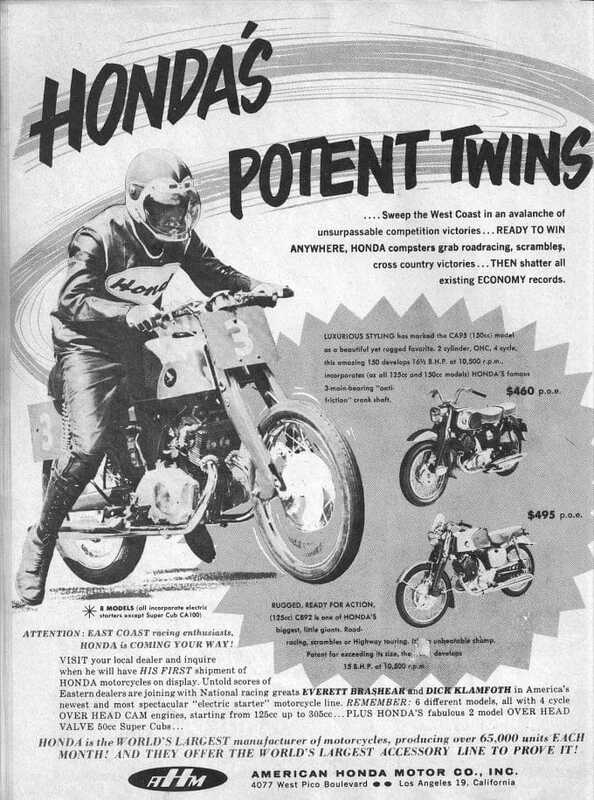 I enjoyed your blog and post on the Honda bikes. That was interesting as I know noting about such things. Hi Pam, I would ride one of those bikes now, but my kids think I am too old and would break something. They are probably right but I have ridden many years ago. That is still a nice bike. thanks for stopping by. blessings today and every day. 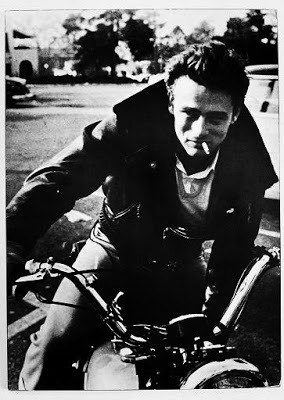 Ah – – – there’s James Dean in the middle there. Not sure if he ever had a Honda or not, but his FAMOUS (or infamous as the case may be) motorcycle was a Triumph Trophy. I agree–getting the feet and the hands together at one time can be a little frustrating! Great post. 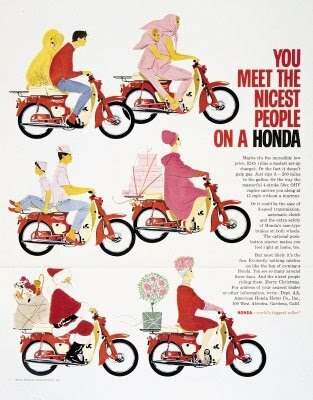 Love those adds – especially Santa on the Honda – great stuff!